The benefit of the internal Document Artifact is that you can create new Elements that are hyperlinked to text of your document. 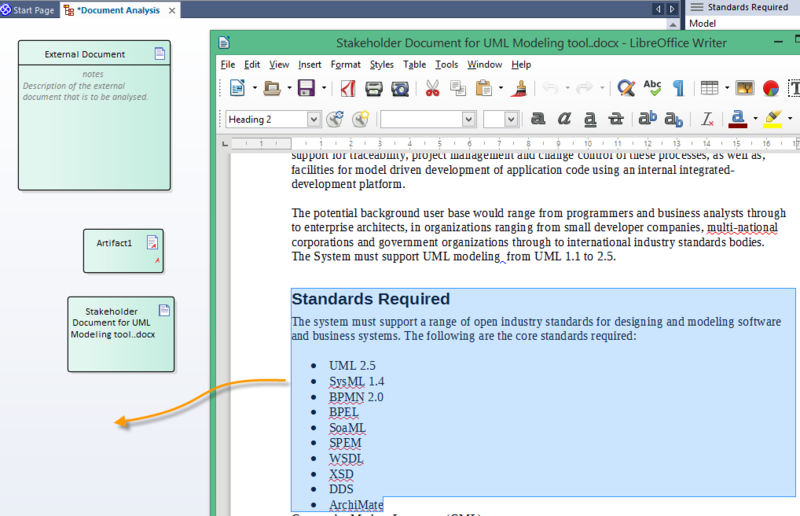 For text documents you can drag text onto the diagram and automatically create Elements from this. The Document remains intact and un-altered (it can be updated in Word if preferred). This covers creating an internal Document Artifact that uses the internal Editor for updating it. From this we will create new glossary entries and create new hyperlinked Elements. The document formats that you can use are .docx and .rtf. 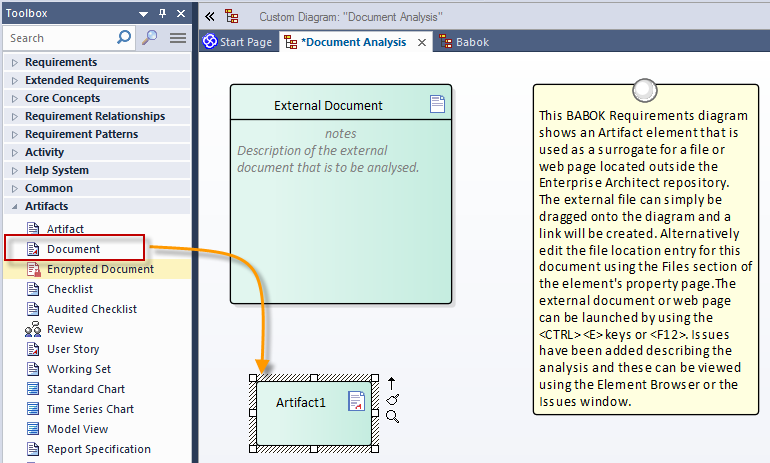 In an Document Analysis diagram create a new Document Element. Drag this onto the diagram. In the New Template for Linked Document dialog, click on the Cancel button. With access to your document in the internal document editor, you can now start to create Glossary terms and Elements from the text. 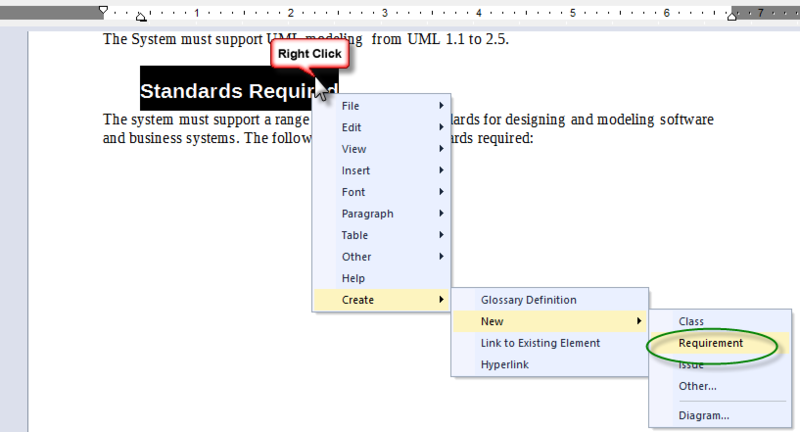 Select Create | Glossary Definition from the context menu. 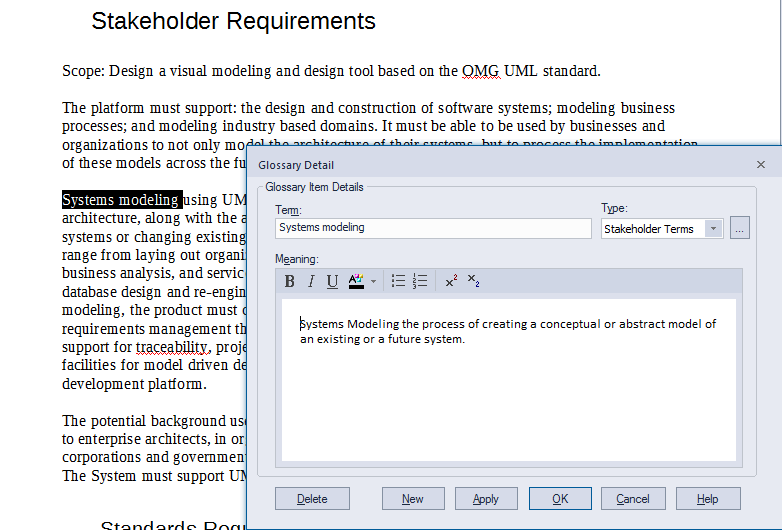 In the Glossary Detail dialog add your description text. Block select some text covering your new Requirement name. Select Create | New | Requirement from the context menu. This creates an Element of that name in the Project Browser. The text used to create this is now a hyperlink to the new Element. Paste the text to the Notes. 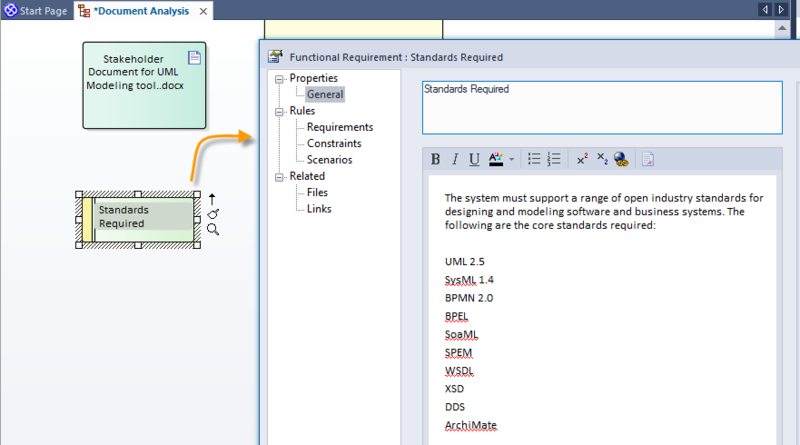 The new Element can be placed on a diagram or it can be viewed in the Specification Manager. The benefit of the OLE Accessible document is that you can drag text onto the diagram and automatically create Elements from this. The Document remains intact and unaltered - it can also be updated via a Word Processor if preferred. 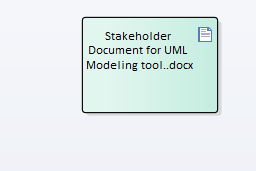 The following steps will guide you through a simple process of importing a document and creating Elements from it in the model. 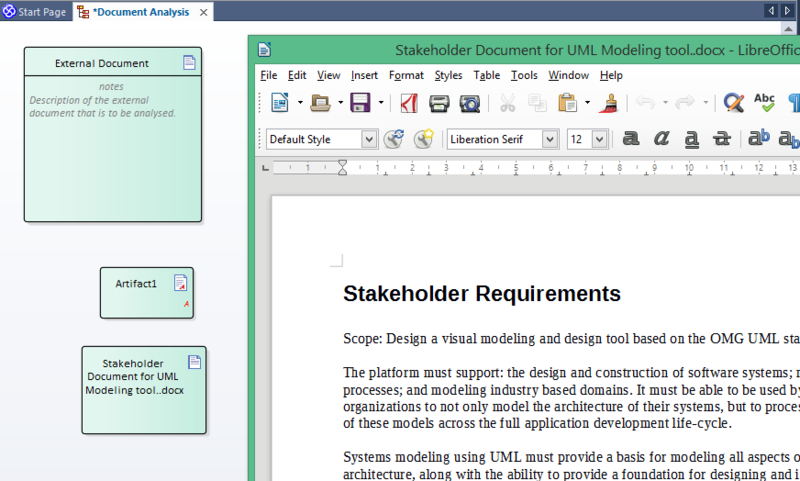 It is assumed that you have Document Analysis diagram open. This will create a Document Artifact Element containing the Document. Double-click on the Document Artifact Element to open the external Word Processor. You will be Prompted to select an Element Type. Your Requirement Element is now contained in the model.